John Layman & Rob Guillory, the minds behind CHEW, and Tim Seeley & Mike Norton, the architects of the gothic noir REVIVAL, come together to whip up an appetizing fusion of their New York Times bestselling and critically acclaimed series for two issues stuffed with adventure in a CHEW/REVIVAL cross-over from Image Comics. Readers will find out what’s on the menu for Tony Chu when he heads into rural Wisconsin—where the dead don’t stay at rest and the living do their best to cope—in CHEW/REVIVAL #1. Seeley added, “Chew showed us all that there was a place for quality off-kilter series, and we're excited to have the cast of our 'rural noir' meet up with America's favorite cibopath. I think we've figured out a great way to take advantage of the ‘WHAT THE HELL’ factor of crossing over two very different worlds that'll make for a great read." “Honestly, even I was shocked how well the two titles gelled together,” said Guillory. “It's a really, really fun experiment that will surprise fans of both books, I think." 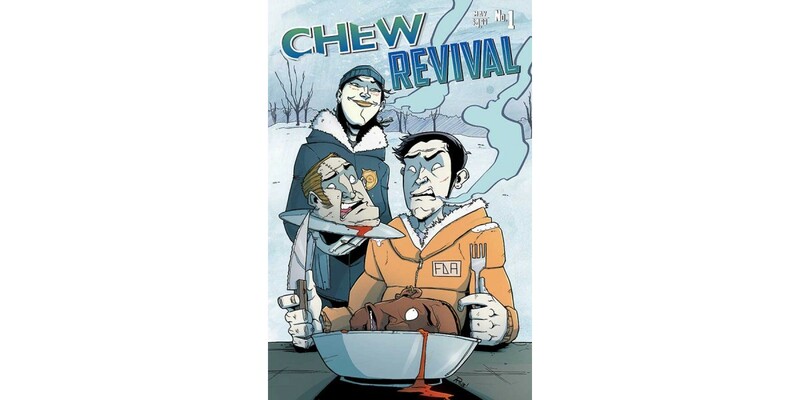 Perfect for fans of CHEW and REVIVAL who are hungry to try something new and a good taste-test for readers new to either series, CHEW/REVIVAL has something for everyone. CHEW/REVIVAL #1 is served in stores on 5/28, and will be available for $4.99. It can be pre-ordered using Diamond Code MAR140497.